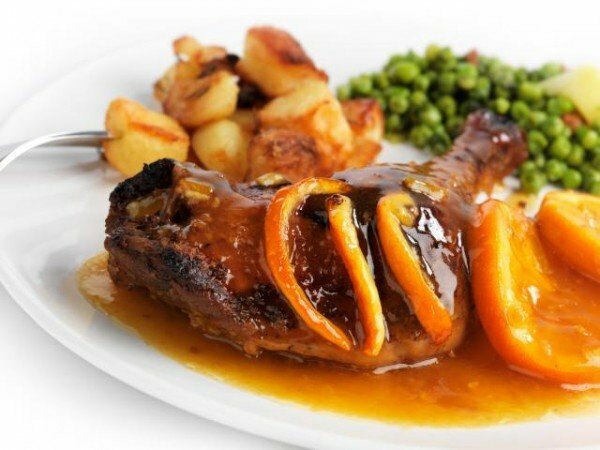 Place duck in roasting pan, pour boiling water and bake in the oven at a temperature of 190 ℃. During baking, coat the duck with the rest of the mixture with honey and occasionally pour hot water. After an hour, place the duck despite remaining orange, cut into circles. Bake for about an hour, until soft. In a small pot for boiling the ginger paste, pepper, wine and densities dissolved in water. Cook 1-2 minutes, stirring constantly. Finally, add sauce by desire.